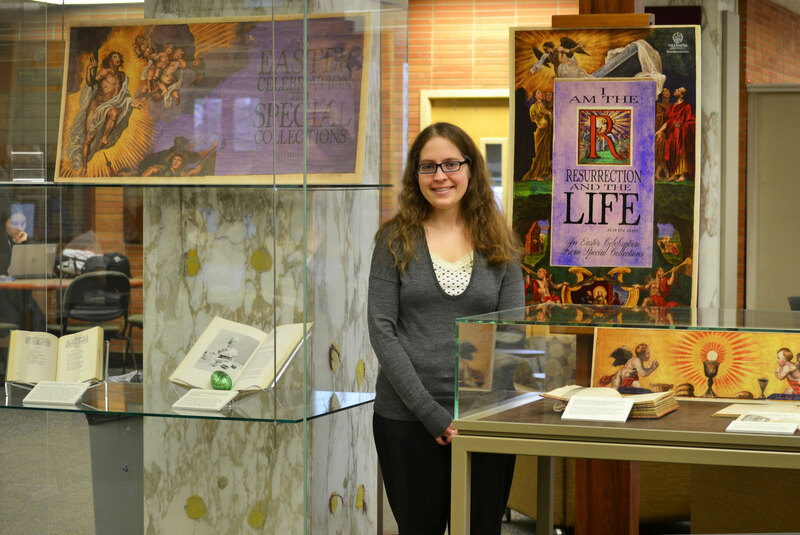 “I Am the Resurrection and the Life (John 11:25): An Easter Celebration from Special Collections” is a broadly based exhibit that appeals to viewers on several levels, intellectual and visual. Designed by Laura Bang, Special and Digital Collections curatorial assistant, and mounted by Bang; Michael Foight, Special and Digital Collections coordinator; and Allison Dolbier, intern, the exhibit will remain on display until the end of April. Joanne Quinn, Falvey’s graphic designer, created posters and other graphics for this exhibit. In her introduction to the exhibit Bang says, “Easter is considered by many to be the most important observance of the Christian year. … This exhibit highlights some of the materials in Falvey Memorial Library’s Special Collections that pertain to Easter and spring celebrations.” In the same tall vertical case as Bang’s introduction are two books, Easter Garland by Priscilla Sawyer Lord and The Easter Book of Legends and Stories edited by Alice Isabel Hazeltine, Elva Sophronia Smith and Pamela Bianco. Easter Garland is open to display two poems. The other book shows a photograph of a young boy dying Easter eggs, and on the opposite page is an article, “Foods of the Easter Season.” At the bottom of this case, a large book, Festivals & Rituals of Spain by Cristina Garcia Rodero and José Manuel Caballero Bonald, is open to a double-page spread, a colorful photograph of purple-robed men wearing tall pointed hats and playing very long horns, part of a Holy Week celebration. In the adjacent case are four books: The Temple: Sacred Poems & Private Ejaculations, Little Pollys Pomes [sic], Christmas-eve and Easter-day and The Villanova Monthly (1893). The Temple … by George Herbert, a seventeenth century poet, is open to show “Easter Wings,” an example of concrete poetry in which the text forms a shape which is “as important an element as the verses themselves” (Bang). 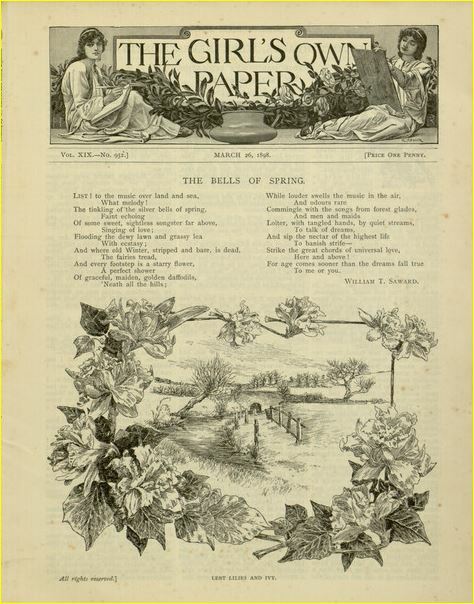 Little Pollys Pomes, written by T. A. Daly in a child’s voice, shows Polly’s poem, “Easter.” Christmas-eve and Easter-day by Robert Browning and The Villanova Monthly both display Easter poems; “He Is Risen” in The Villanova Monthly was written by R. A. G., a Villanova student. 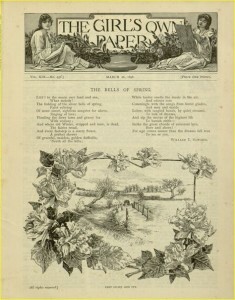 Popular culture is presented in the next case with issues of Golden Days (1880), The Girl’s Own Paper (March 26, 1898) and The Chicago Ledger (April 9, 1910) each displaying articles and/or poems relating to Easter. An equally large Missale Romanum (Roman Missal), printed in Antwerp, Belgium, in 1773 is in the same case. 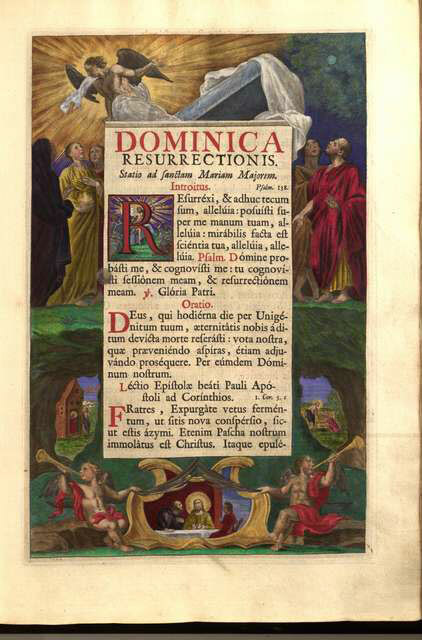 A Roman Missal is a liturgical book containing the texts used in the celebration of the Roman Catholic Mass. This Missale Romanum is open to pages showing on the left an illustration of the Resurrection and on the right the text for Easter Sunday (Resurrection Day) Mass. Displayed alone in the next case is a large volume, an open Biblia Latina. The original Biblia Latina, more commonly called the Gutenberg Bible, was printed by Johannes Gutenberg in Mainz, Germany, in the 1450s using movable type, the first important book printed this way. It began the age of printed books; only 48 copies or partial copies of the Gutenberg Bible survive. The Biblia Latina shown here is a facsimile, one of only 1,000 copies printed in the United States in 1961. This facsimile is open to the beginning of the book of Acts “which describes Jesus’ appearance to the Apostles after his Resurrection …” (Bang). Although the Bible is printed, its colorful decorations continue the tradition of hand-illuminated manuscripts and the colorful decorations on the right-hand page are truly spectacular. Three books occupy the final case in this Easter exhibit. Most impressive both in size and illustrations is the Evangelorum Quattuor Codex Cenannensis, the Book of Kells, a facsimile printed in 1950. The original Book of Kells was probably written and decorated c.800 at a monastery at Kells, Ireland. Today it is housed in the library of Trinity College, Dublin, Ireland. 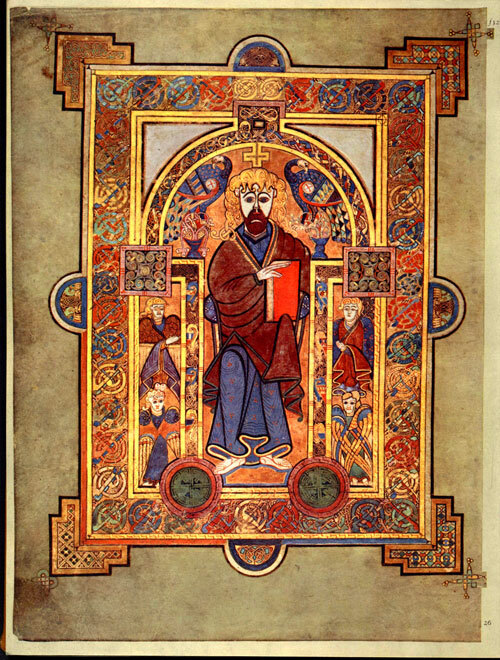 The Book of Kells, a Hiberno-Saxon manuscript richly illuminated on vellum (calf skin), contains the Gospels of Matthew, Mark, Luke and John. It was likely intended to be used at the altar of the monastic church. Special Collections’ facsimile is opened to show two of the many illustrations, a Christ in Majesty framed in elaborate Celtic interlace and a cross carpet page. Cross carpet pages are full-page cross designs without text; this one incorporates eight circles and is filled with Celtic interlace. These two pages are part of the Gospel of St. Matthew. A much smaller book, The Christian Year: Thoughts in Verse for the Sundays and Holydays Throughout the Year by John Keble, published in 1874, is open to display a sepia-colored Crucifixion on the left and “Good Friday,” a poem on the right. Kehle was a poet and churchman. The third book, by Pacificus Baker, The Lenten Monitor. Of Moral Reflections and Devout Aspirations On the Gospels: For Each Day From Ash-Wednesday to Easter Sunday, is open to “At Blessing of the Palms” and “Reflection.” Baker was an eighteenth century English Minorite friar; this volume was published in 1834. After a long, bitter cold winter, this exhibit welcomes the Easter season, the beginning of spring. On display are works both sacred and secular. It is an exhibit worth viewing and contemplating. Article and photographs by Alice Bampton, digital image specialist and senior writer on the Communication and Service Promotion team.